Traditionalist British Bishop Richard Williamson has been automatically excommunicated, along with the priest he illicitly ordained a bishop, reports the Catholic News Service. Bishop Williamson,who has denied the Holocaust, violated Church law when he ordained Father Jean-Michel Faure, 73, a bishop, without papal approval during a ceremony yesterday in Nova Friburgo, Brazil. While the Vatican did not comment immediately, canon law provides automatic excommunication for the newly ordained Bishop and for the Bishop ordaining him in cases where the ordination goes against the will of the Pope. Bishop Williamson had been excommunicated in 1988 when he and three other traditionalist bishops were ordained against Papal orders by the late French Archbishop Marcel Lefebvre, founder of the Society of St Pius X. Pope Benedict XVI lifted the excommunications in 2009 as a first step toward beginning formal talks aimed at reconciliation with the group. However, there was widespread outrage at revelations that Bishop Williamson had denied the gassing of Jews in Nazi concentration camps. The Vatican said Benedict had been unaware at the time of the Bishop's radical views on the Holocaust. 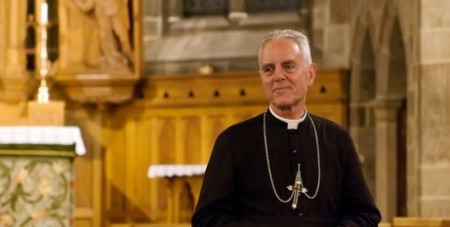 Bishop Williamson, who opposed SSPX holding reconciliation talks with the Vatican, was ousted from the society in 2012. He and a number of followers did not support reconciliation with Rome because they believe the Vatican had strayed from the Catholic faith since the Second Vatican Council.